To familiarise and help with a newly introduced online system, the Staff Selection Commission has released a four-minute duration tutorial video. The SSC MTS 2017 online examination will be conducted from dates September 16 to September 26, 2017. It is the for the first time, SSC is conducting a Computer based examination for MTS recruitment. Like practice test, which was introduced a few days before, the tutorial video is also made by the SSC to avoid confusion, fear, and anxiety of appearing candidates. Until this year, the SSC MTS examination was a pen and paper mode examination. After the leak reports of exam previously conducted starts coming out, the paper-1 of SSC MTS examination once conducted, earlier this year, was canceled. familiarise the candidate with its screen elements and their respective functions. Here are some key points to remember while writing SSC MTS Computer based examination. The video starts by explaining how to log into the system for attending the examination. To start writing the SSC MTS 2017 exam, the candidate has to the first login with his/her roll number and password. But before that, the Test Administrator has to log in, as it is a two-level access. The login screen for the candidate will only appear on screen after Test Administrator's login. 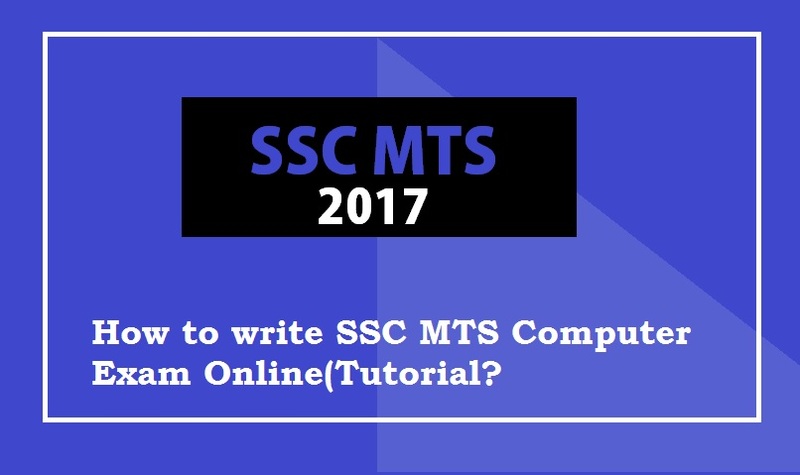 How to do SSC MTS computer based online exam successfully? * Once the Test Administrator logs in with their username and password, the candidate will get their login screen on the exam attending computer. Now the candidate can log in by filling in their roll number and password. * After logging in with the roll number and password, the complete details regarding the candidate is shown. The system will ask to verify the details. Read carefully every detail and make sure that it is correct. If not, the candidate has to inform the exam invigilator. * Once the confirmation of details is done, a page showing examination instructions appears to the candidates. Read the examination instructions carefully, and after that confirm that you have read all instructions by clicking on the Confirm button. * After confirming the instructions, the system will take the candidate through a sample test. During this, the candidate is shown how the question paper will appear on the screen, how to re-visit an unattended question, how attended issues and neglected problems are hinted on screen, etc. In fact, this is a mini version of an original test. * After the sample test is completed, the candidate can click on the button "Get ready to start the exam" option and start writing the original examination. The time duration and time left will be displayed in the upper right corner of the screen. * Even if you attended all the examination questions and completed your examination, there is no provision for submitting the exam before the exam duration is met. Five minutes before the completion of SSC MTS examination period, the candidate will be notified of the time left. * The system will automatically submit exam after the duration is met. Once examination time is over, and submission is made, the final page shows the number of questions attended by the candidate and number of questions that are unattended. Now before leaving the hall, the candidate have to click on the exit option to exit from the examination session. Read more about SSC MTS 2017 new exam dates here.